Balsamic Brussels Sprouts with Bacon and Pecans is one of my favorite easy brussels sprouts recipes! 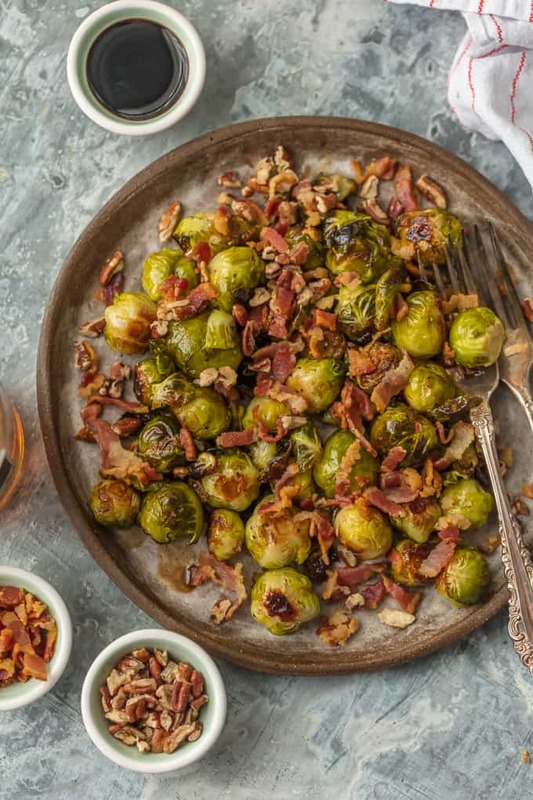 These Roasted Brussels Sprouts with Bacon and Balsamic and Pecans are packed with flavor and crunch. 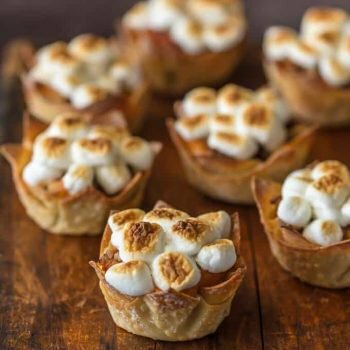 They are utterly delicious and fool proof. Everyone (even the kids) loves this Roasted Balsamic Brussels Sprouts Recipe! Balsamic Brussels Sprouts have made me LOVE Brussels Sprouts for the first time! 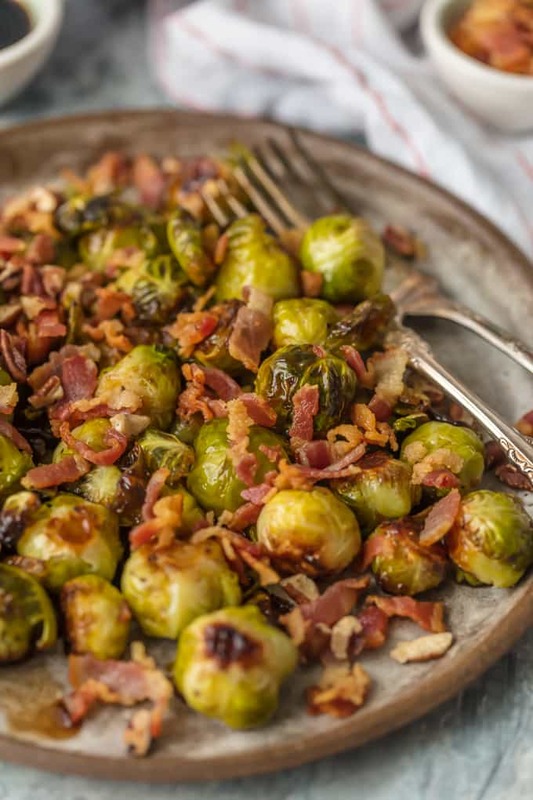 These roasted brussels sprouts with bacon and balsamic are so easy and so flavorful. 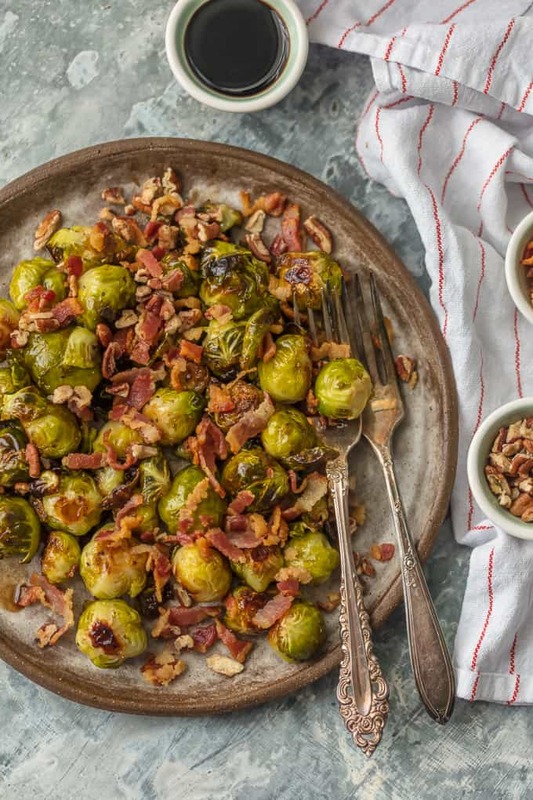 These Balsamic Brussels Sprouts with Bacon and Pecans are the ultimate holidays side dish. I’ve got Thanksgiving on the brain 24/7 right now. By the time it gets here, I’m going to want nothing to do with it! Plus I’ll have already tested and eaten enough recipes for probably 10 holiday feasts. and more! We are cooking up a STORM! With all that cooking, this Balsamic Brussels Sprouts Recipe remains a favorite. I thought I’d cook some veggies. Something healthy. BRUSSELS SPROUTS! Don’t start with me about adding bacon and balsamic and all that jazz. I made vegetables. And they’re delicious. A little bacon just adds a little flair. And makes the kids want to dig in too! Roasted Brussels Sprouts with balsamic vinegar couldn’t be easier, and once you try this recipe, you’ll understand why it’s a favorite. These roasted brussels sprouts are just begging to be on your Thanksgiving menu. 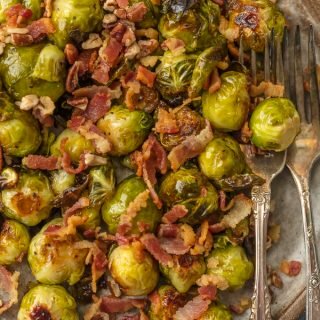 If you already love brussels sprouts, these Crispy Bacon Pecan Balsamic Brussels Sprouts (actually MAPLE Balsamic) are going to be your dream come true. If you’re not sure if you’re a fan, these are the perfect gateway brussels. My Mom has hated Brussels Sprouts since she was a child. A case of having tasted rubbery and tasteless greens one too many times. 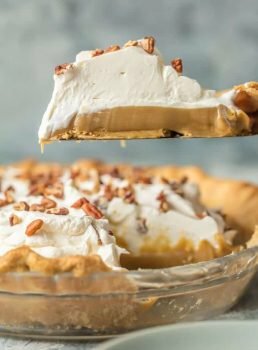 Recipes like this and our Stovetop Brussels Sprouts with Pear and Blue Cheese have completely changed her mind! Next thing you know you’ll be eating them fried, raw, broiled, you name it! But these Balsamic Brussels Sprouts have so much flavor you don’t even realize what you’re eating. Kids can like their greens when you make them like this! What are the health benefits to eating roasted brussels sprouts? Brussels sprouts are rich in many vitamins and nutrients. They are an excellent source of vitamin C and vitamin K. They also have lots of nutrients like folate, manganese, vitamin B6, dietary fiber, vitamin B1, potassium, and omega-3 fatty acids. Super food, indeed! What do brussels sprouts taste like? When properly cooked, brussels sprouts are rich and buttery. When incorrectly handled they can taste bitter or limp. We are here to change your negative perception of roasted brussels sprouts! How do you make Roasted Brussels Sprouts crispy? See the recipe card below, but they key is to cut off the ends, drizzle with olive oil, and let the oven do its thing. You want them crispy on the outside and tender on the inside. 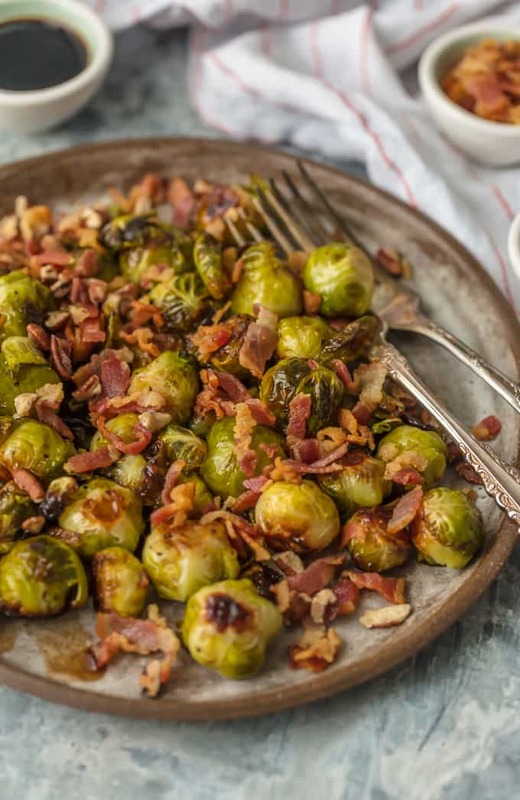 Will this Bacon Pecan Balsamic Brussels Sprouts Recipe Be On Your Holiday Menu? Please tell me you have room in your holiday menu for these beauties. A little bit salty, a little bit sweet, a whole lotta delish. With all these recipes we are testing these days, this is a shining favorite. I just love the texture, the flavor combo, and that I’m choosing to believe they’re healthy for me. Healthier than Garlic Butter Mashed Potatoes at least…right? I’ll be eating plenty of those too, don’t you worry. See the recipe card below for full details on How to Make Roasted Balsamic Brussels Sprouts. Enjoy! Balsamic Brussels Sprouts with Bacon and Pecans is one of my favorite easy brussels sprouts recipes! These Roasted Brussels Sprouts with Balsamic, Bacon, and Pecans are packed with flavor and crunch and are utterly delicious and fool proof. Everyone (even the kids) loves this Roasted Balsamic Brussels Sprouts Recipe! 1 pound Brussels sprouts; stems & outer loose leaves removed. Heat oven to 350°F and line a baking sheet with foil. Place pecans on prepared baking sheet and bake until fragrant and a little darker in color, approximately 3-5 minutes. Watch closely so they don’t burn. When done, transfer pecans to a heat-resistant bowl to cool and increase oven temperature to 425°F. While pecans are toasting, cook the bacon pieces, over medium heat, in a medium-size skillet. Fry the bacon until crisp, then transfer bacon pieces to a bowl. Keep the bacon fat/drippings. In a medium mixing bowl, combine Brussels sprouts, bacon fat, olive oil, salt, pepper and red pepper flakes. Spread the Brussels sprouts onto the same foil-lined baking sheet used for the pecans. Roast the sprouts 20 minutes or just until tender. In a small bowl, whisk together the balsamic vinegar and maple syrup and pour the mixture over the Brussels sprouts. Toss lightly to coat the sprouts evenly, and place back in the oven for 5-8 minutes until caramelized. Do not allow the sprouts to burn. Transfer baking sheet to a cooling rack, season to taste (if needed). 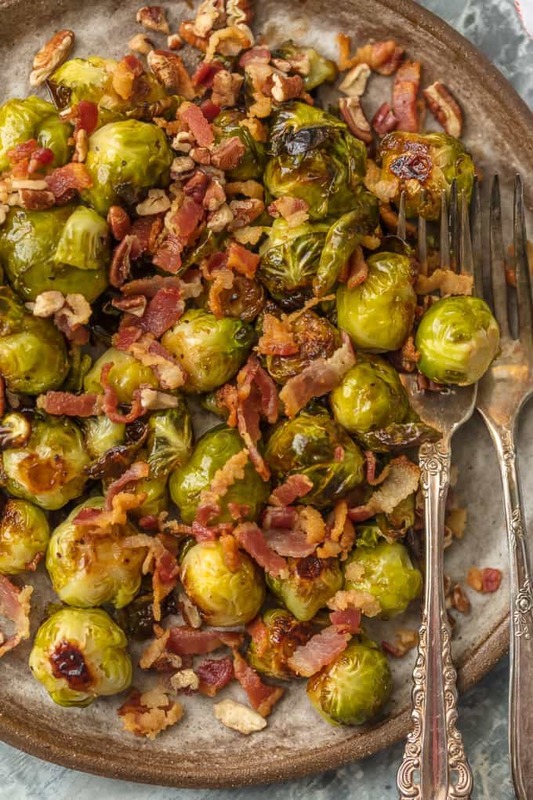 When ready to serve, sprinkle the sprouts with toasted pecans and crispy bacon. This dish is delicious hot or room temperature.